24 cm xiv, 1098 p.
H.P. Lovecraft fused supernatural horror with visionary science fiction; this volume collects together all of these writings. This is an exquisitely designed edition that features a silk-ribbon bookmark, distinctive gilt edging & marbled endpapers. This is the perfect gift for book lovers and an artful addition to any home library. In the 1920s and '30s, H.P. Lovecraft pioneered a new type of fiction that fused elements of supernatural horror with the concepts of visionary science fiction. Lovecraft's tales of cosmic horror revolutionised modern horror fiction and earned him the reputation of the most influential American writer of weird tales since Edgar Allan Poe. "H.P. 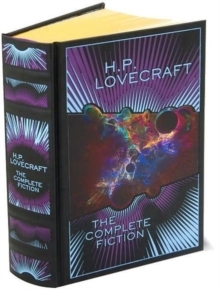 Lovecraft: The Complete Fiction" collects for the first time in a single volume all of Lovecraft's groundbreaking fictions. The book is exquisitely designed with bonded-leather bindings, distinctive gilt edging and an attractive silk-ribbon bookmark. Decorative, durable, and collectible, the "Leatherbound Classics" series offers hours of pleasure to readers young and old and is an indispensable cornerstone for any home library.